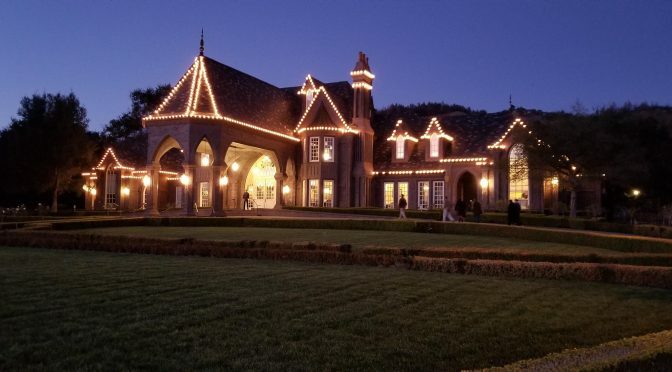 Please welcome guest writer Steve Ledson in this wonderful recounting of the Judges Dinner for East Meets West Wine Challenge, which was graciously and deliciously hosted at the Ledson Castle. 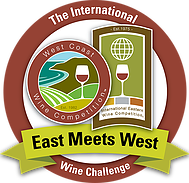 Hosting Chris Sawyer and 35 amazing wine judges and wine writers from all over the United States. As I approached the Castle from the south, the sun was just setting against Hood Mountain creating this amazing back drop for the Castle. The driveway lanterns were lit and the Castle just glowed with all its lights setting it off against the twilight of this majestic backdrop. What an amazing site. Walking up the steps and into the entrance I could hear the chatter of everyone’s excitement of what this evening had to share for all of us. To my right was our Dining Room that Stacey and her staff including her incredible husband Sean had set up with black table cloths and napkins and a beautiful flower arrangement of red, white and blue in the center of each table. Every glass and piece of china was in perfect order. I stood and just stared for a moment. It was so rich and inviting. Probably one of the best dining room settings I’ve seen over the last 20 years. Stacey shuttled me along into Winslow’s Bar where everyone was mingling, Jerry and Brendon were pouring behind the bar with their amazing smiles and incredible hospitality. It was easy to see how everyone was soaking up the attention and kindness of these two handsome gentlemen. I was extremely proud of them as I watched everyone’s enthusiasm as the night unfolded. Scott Eddinger and his lovely wife Audrey were seamlessly moving through our guests passing hors d’oeuvres while mingling and chatting as the guests arrived. Both perfectly dressed for the occasion. Chef Kendyl Bilenkij stole the night starting with her amazing pairing of pickled Shrimp in a Meyer Lemon sauce and Chicken Pate paired so perfectly with our Russian River Pinot Noir Reserve and our Mountain Terraces Viognier. It was quite impressive to watch these two as they offered up Chef Kendyl’s amazing appetizers’ with a very warm and nourishing smile making guests feel so welcome. With a tap of the glass Chris Sawyer froze the crowd as he introduced me in a way that made me feel like a King. This man has a way of making every person feel important. Chris shared stories of some of the great times he and I have shared over the last 30 years bringing back very special moments during my life here in Sonoma County. There is nothing better than reminiscing great moments of your life. As I spoke to our Guests it was important to me to recognize all of you here at Ledson. I explained we are just one big family and each and every one of us plays a very important role in the success and most importantly the image we have in the wine world today. I was very proud to speak and represent all of us in front of some of the greatest wine judges and wine writers in the United States today. Thank all of you for your continued efforts and hard work that has lifted us to an image anyone should be very proud of. Stacey announced that dinner was served so we slowing flowed into the Dining Room. Stacey and Sean along with Scott and Audrey, as well as Brendon seamlessly served us an incredible meal. The first course, a citrus salad paired with our Zina Hyde Russian River Sauvignon Blanc. The phenomenal entrees of Salmon and Filet Mignon were shared with our Mes Trois Amours, Bellisimo and the Sonoma Valley Estate Reserve Merlot. To finish the evening, Chef Kendyl prepared decadent chocolate cake served with fresh raspberries which we paired with our award winning Stagecoach Reserve and the Mountain Terraces Lex’s Cabernet Sauvignon. With each course and each pairing, Chris and I introduced the wines as our Guests anxiously listened and graciously commended the entire setting and event. Hours passed by like swift moments in time. Each and every attendee was provided with the most impeccable wines, food and service. At the close of the evening every single person there made a point to come to me personally and thank me. It just shows what can happen when you have a team of passionate people working together. To sum it all up for the evening in short. Incredible food, incredible service in and incredible atmosphere with and Amazing group of very talent People. I’m very proud to be a part of this amazing event, not only should all of you me proud for the incredible job you all did last night, each and every one of you who works here at Ledson should be proud of the image that was present last night to some very talent wine writers and wine judges traveling here from all over the United states. A very special thanks to my Dear Friend Chris Sawyer for making this all happen. Previous PostVOTE for Industry BEST OF at Spirited Magazine!Next PostAfrican American History Month meets the Wine Industry!